The Duration Room Divider has the same qualities as our sliding patio door but this particular Room Divider is specially designed to be used internally. With it's slim profiles and 23mm low threshold it provides you with a very functional sliding room divider that is suitable for both commercial and domestic applications. The low threshold can be sunk into the floor to achieve a minimal step over (of around 14mm). All panels slide - no need for fixed panels. Slim-line design and a 99mm depth of frame. Designed specifically for use internally as a partition between two rooms. Specially designed 23mm low threshold (with an 11mm clearance), for minimal step over. 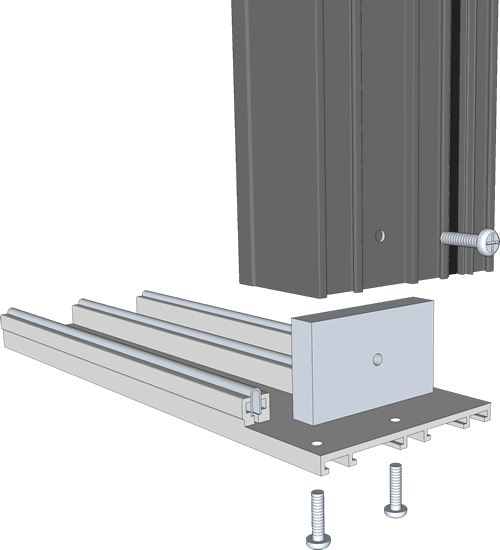 Three track system for flexibility and maximum openings. Slides on stainless steel tracks and tandem wheels for smooth operation. Can be single glazed or double glazed for greater thermal efficiency. Uses a superior polyamide thermal break barrier for high thermal efficiency. Single point hook locking - Key operated one side with a finger pull on the other side. Adjustable rollers for ease of installation. Outerframe usually supplied in knock down kit form for easy handling. Small/medium doors can be supplied made up if required. All doors come with anti-lift stops and wool pile included. Room Dividers are suitable for both commercial and domestic applications.